* Hair preparation and hair accessory rental are not included. These services are available for an additional fee. Hair preparation service ￥4,500（＋tax） * Hair preparation service by appointment. * Kimono collection is until 15:00. * Please return the kimono to the shop by 18:00 the same day. * Note that it will take about 30 minutes to choose and fit the kimono. Emails can be in English or Mandarin Chinese. Please pay at the shop upon collection. If you wish to cancel or change the reservation, please let us know 2 days in advance. Failure to collect without prior contact will result in being charged the full amount. * Hair preparation by appointment. * Please allow an additional 30 minutes if requiring hair preparation. 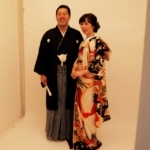 Have a beautiful album of photographs showing you in your kimono made in our private studio. * Photography service by appointment. * We don't retouch any photos. These formal kimonos are guaranteed to create a special memory of Japan. Note: this service requires reservation and a preliminary meeting before renting. What are 'Houmongi 訪問着', 'Furisode 振袖', and 'Tomesode 留袖'? What’s the difference between them? 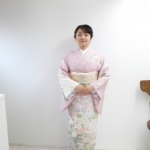 Ｑ．What type of kimonos are available in the '1-Day Kimono Rental'? Ａ．For our standard one day rental, we will prepare a 'komon 小紋' for you. This kimono is a type of daily wear and is good for general strolling. We have a wide variety of komons (e.g. colourful; cute; minimalist; elegant) from which you can choose your preferred style. If you wish to try a more specialist kimono, we recommend the Formal Kimono 'Houmongi 訪問着', 'Furisode 振袖', and 'Tomesode 留袖' Rental Service. Ｑ．Can I leave my normal clothes and luggage with you when taking the kimono out? Ａ．You can leave belongings in the shop while you use the kimono. However, we cannot take responsibility for these so please take valuables with you. There is no charge for leaving objects at the shop. Ｑ．How long does it take to dress in a kimono? Ａ．This may vary depending on how busy the shop is at a particular time. Generally it will take about 20 minutes to choose the kimono, and a further 20 minutes to dress. Ｑ．I cannot return the kimono before 6pm on the same day. Can I return it the following day? 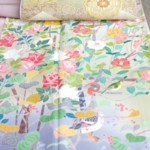 Ａ．It is possible to return the kimono the following day, although an extension fee of ￥1,080 will apply. If you do wish for an extension, please inform us before leaving the shop. If you are already out when you decide you require the extension, please be sure to contact the shop. Ｑ．What happens if the kimono gets dirty and/or torn while being rented? Ａ．If the kimono becomes noticeably dirty and/or torn, we will charge you the cleaning or repair costs. We ask for your kind understanding on this issue. Ｑ．Is it possible to go to the shop and rent a kimono on the desired day without a reservation? 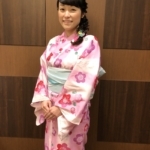 Ａ．Kimonos may be provided without a reservation if a professional staff member is available. However, due to a limited number of staff members, customers with reservations will be given priority. Because of this we recommend making reservations in advance. Ｑ．If I decide I need hair preparation at the last minute, is it available? Ａ．Hair preparation may be provided without reservation if a professional staff member is available. Please ask us. But we recommend making reservation in advance. Ｑ．Is it difficult to wear a kimono in bad weather? Ａ．Kimonos can be worn in bad weather. We can also supply you with a raincoat and/or overcoat for your kimono (￥2,000～ ＋tax). 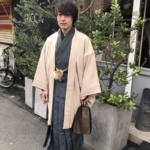 What are 'Houmongi 訪問着', 'Furisode 振袖', and 'Tomesode 留袖' kimonos? What’s the difference between them? These kimonos are for wearing on formal or special occasions. 'Furisode' and 'Houmongi' are more luxurious in patterns and colors than the more casual “Komon” kimonos. Specifically, 'Furisode' is the first formal style of kimono for unmarried young women, and is therefore youthful and cute in style. And, the length of sleeves is longer than some other kimono. 'Tomesode' is the formal style of kimono for married women. It combines a black silky texture with an ornate and distinguished pattern below the waist, making it both cool and beautiful. © 2019 きもの六花（ricca）.Co.,Ltd All right reserved.